Of the dozens of books written about Orson Welles, most focus on the central enigma of Welles's career: why did someone so extravagantly talented neglect to finish so many projects? Film critic Jonathan Rosenbaum has long believed that to dwell on this aspect of the Welles canon is to overlook the wealth of information available by studying the unrealized works. 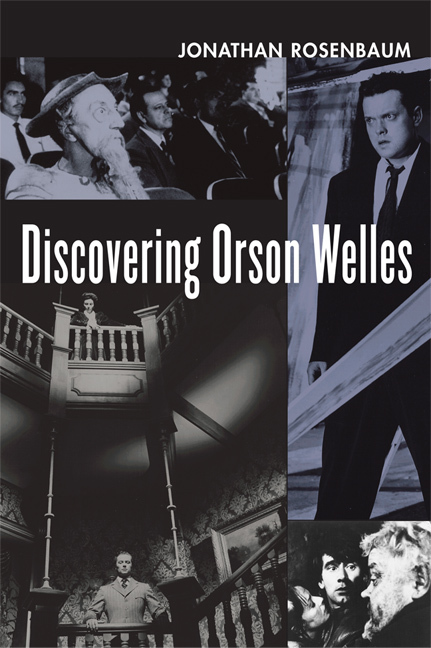 Discovering Orson Welles collects Rosenbaum's writings to date on Welles—some thirty-five years of them—and makes an irrefutable case for the seriousness of his work, illuminating both Welles the artist and Welles the man. The book is also a chronicle of Rosenbaum's highly personal writer's journey and his efforts to arrive at the truth. The essays, interviews, and reviews are arranged chronologically and are accompanied by commentary that updates the scholarship. Highlights include Rosenbaum's 1972 interview with Welles about his first Hollywood project, Heart of Darkness; Rosenbaum's rebuttal to Pauline Kael's famous essay "Raising Kane"; detailed essays and comprehensive discussions of Welles's major unfinished work, including two unrealized projects, The Big Brass Ring and The Cradle Will Rock; and an account of Rosenbaum's work as consultant on the 1998 re-editing of Touch of Evil, based on a studio memo by Welles. Jonathan Rosenbaum writes film criticism for the Chicago Reader and has written on film for many other publications. He is also the author of many books, including Movies as Politics (UC Press, 1997). 26. When Will—and How Can—We Finish Orson Welles’s DON QUIXOTE?